See chapter 8 of Rainwater Harvesting for Drylands and Beyond, Volume 2, 2nd Edition for info on how to optimally place, design, and build curb cuts and curb cores with their mulched and vegetated basins. • Permit is $45, but this can be for a whole block’s worth of curb cuts/cores, so you are incentivized to work with your neighbors. To clarify: It is $45 per permit, but you can have many curb cuts/cores on one permit. • 4-inch-diameter core hole through curb. Minimum cost is $160 for crew to show up, but this covers the drilling of 5 core holes. If more holes are needed, the cost is $30 per hole (assuming a 6-inch-thick curb). Costs increase—$5 per inch—the thicker the curb. A contractor friend that cores the curb himself rents a hand-held core-drill (from Sunbelt Rental on Ft. Lowell – these drills are otherwise hard to find for rent). The rental for the whole drill set-up is $66 per day. Interesting side note: Tucson Concrete Cutting and Coring—the coring company I recommend—says 1% of their current work is water-harvesting related. • Cheapest option—for a curb up to 6 inches (15 cm) tall—is to rent a gas-powered, 14-inch (350-mm) diameter circular saw with diamond-carbide blade. This method also enables you to do a 14-inch-wide curb cut with 45º angled sides. Note that curbs taller than 6 inches (15 cm) will likely require a saw with a 20-inch (500-mm) diameter blade. Person doing the work must be very careful to make good clean, straight cuts. To make the horizontal cut, the basin inlet must be dug before the cut is made, so saw can cut along the dirt-side of the curb at the elevation of the bottom of the curb-side street gutter. Once all cuts are made and the cut-out section of curb is removed, the remaining curb and the cut areas must be ground smooth with a grinder. Note 1: Larger/taller curbs may require a larger saw with a 20-inch (500-mm) diameter blade, but this saw is much heavier, more difficult to use, and more dangerous to use than a 14-inch saw. So operator must be strong and very careful. Note 2: This DIY approach is not currently legal in Tucson, where you are required to hire a contractor to do the cutting of the curb—see below for those prices. Note 3: This DIY approach is legal in other communities (check with your local authorities). • Curb-cut cost is $400 per cut (done by Custom Saw Cuts in Tucson). This price drops as you do more cuts. If you are doing 4–5 cuts, the price drops to $350 per cut. Once all cuts are made and the cut-out section of curb is removed, the remaining curb and the cut areas are ground smooth with a grinder. The equipment used by Custom Saw Cuts makes longer-sloping sides angled less than 45º (the saw cannot cut as steep as 45º). Note that contractors who do the cut with a 14″ circular saw can charge much less because they don’t need the very expensive horizontal-curb-cutting machine. 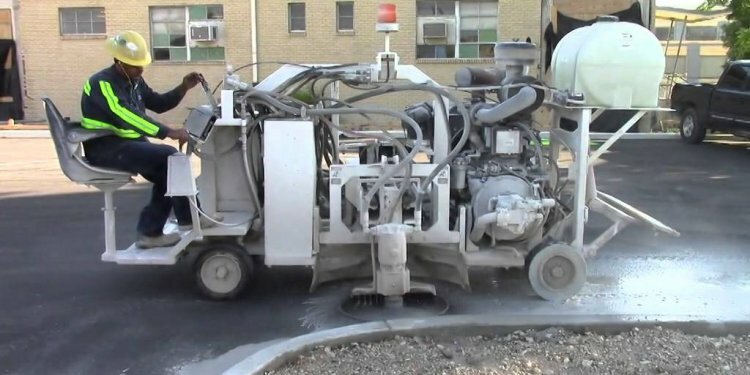 Tucson Concrete Cutting and Coring has the equipment to do this; call them for an estimate. Interesting side note: Custom Saw Cuts—Tucson’s horizontal-curb-cut contractor—says 7-10% of their work is water-harvesting related. • Free if you and neighbors do the digging by hand (just make sure you first call Blue Stake—a free service marking underground utilities—to make sure you are not digging where there are underground utilities). Interesting side note: The backhoe operator I recommend—John Litzel of Little John Excavating—says 40–60% of his work is water-harvesting related.